The 2000 Concert season is rapidly approaching. your interest in and appreciation of our music. introducing new material at our performances. that we had captured it. I ask the band to give us a good turn upon it." by right of conquest a song, nothing more. An MSNBC network political pundit recently reported that after much deliberation, the Gore 2000 Presidential Campaign committee had selected Love Train by the O'Jays as their theme song to energize the party faithful at upcoming political rallies. In former political campaigns, Franklin Delano Roosevelt motivated and inspired a depression driven generation with his "Happy Days Are Here Again" campaign song and John F. Kennedy paved the road to the presidency with a Frank Sinatra rendition of "High Hopes" in a close popular election. Although it is doubtful that any candidate was ever elected or rejected as President of the United States because of a song, the fact remains that since 1800, the campaign song continues to reappear as part of the quadrennial electoral process.The heyday of the campaign song spanned the decades from 1840 through the early years of the twentieth century. Mid-nineteenth century campaigns bore little resemblance to their present-day descendants. In the years before mass media like radio and television assumed such important roles in electoral politics, candidates made their way slowly across the nation to deliver speeches and meet voters in person. Campaigns were hard work and local party activists would organize long marches, rallies and picnics. Brass and string bands would lead parades in the country towns and cities at meetings and rallies. Among the various political paraphernalia that would be published and created to support the party's cause was the campaign songbook or songster. These songbooks contained materials elaborating on the candidate's major campaign points. For example, the Republican Party songster from Abraham Lincoln's 1860 campaign for the presidency had the title, "The Rail Splitter's Songbook". The lyrics of the some of the songs in the book portrayed Lincoln as a rugged clean-shaven rail-splitter from Macon County, Illinois. Throughout the songster's pages the candidate is shown engaged in physical labor, although by profession Lincoln was a lawyer. Campaign singing was an integral part of the political pageantry of the nineteenth century. The singing of a good campaign song was equal to the delivery of a quality campaign speech. A song quite often, was the most effective means to broadcast the candidate's message to a captive mass audience. 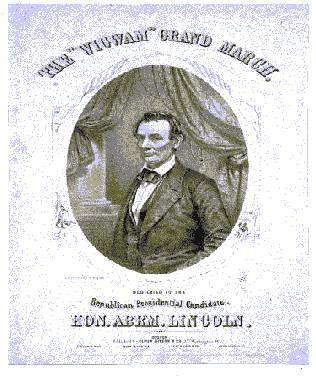 Lincoln and Liberty is a classic example of the many songs that were used to support Abraham Lincoln's 1860 campaign for President. The song uses the melody from an 1830s Irish drinking song, "Old Rosin, the Beau". The melody was also used by Jesse Hutchinson of the Hutchinson Family Singers as a vehicle for their abolitionist rallying song, "Liberty Ball". This captivating tune was very popular with the American people. In addition to serving as a vehicle for abolitionist rallying songs its melody was also used by alcoholic reformers even though in its original form it was a drinking song. The following lyrics from the song Lincoln and Liberty will give you a flavor for the patriotic and political campaign spirit of Lincoln's day. Our chieftan so brave and so true! For Lincoln and liberty, too! Willard Wheeler Nye raised a few eyebrows when he showed up at a Union enlistment office. Only 14 years old, and slightly built even for his age, he seemed an unlikely soldier, but the 23d Illinois found a place for him as their drummer boy. In less than two months, Nye was captured. Besieged at Lexington, Missouri, his regiment waited five days for reinforcements that never came. On September 20 the Illinoisans surrendered and shortly thereafter paroled. After a short visit home, Nye signed up again, with his friend Captain Edgar Trego. All Illinois units being full, they joined the 8th Kansas Infantry. The two served together on garrison and provost duty, then left for the front in Kentucky. They fought together until September 1863 and the Battle of Chickamauga. Trego kept a protective eye on Nye throughout the fighting of that day and took him along on an evening sortie to collect wounded men from the field. During the excursion, Trego was killed by a sharpshooter's bullet. Nye, devastated by the loss, packed Trego's belongings for shipment back to his widow. With the package he enclosed a note: "Captain Trego was a brave soldier, a fine man and a splendid gentleman. He was always good to me." Nye continued to serve during the siege of Chattanooga and in the battles around that city in November, where he was often called upon to carry wounded and assist the surgeon. In December, exhaustion, poor rations, and bad weather took their toll on the diminutive drummer boy. He fell ill and was discharged from duty. After four months of recuperation at home, he enlisted as a 100-day volunteer in the 139th Illinois. He served on garrison duty until he was finally mustered out in October 1864. At the close of the war, Nye returned to school. He became a medical doctor and eventually settled in Hiawatha, Kansas, where the "Little Doctor" (even as an adult he was barely over five feet tall) became a respected member of the community until his death in 1938 at the age of 92. On the afternoon of May 29th the Balladeers will have the honor of performing from the granite steps of the General Grant National Memorial to celebrate Memorial Day in New York City. The U.S. Grant National Memorial is the largest mausoleum of it's kind in North America. Popularly known as Grant's Tomb, it is the final resting-place of the former President and his wife Julia Dent Grant. The marble structure was completed in 1897. The Army of the Potomac under General Grant finally forced Robert E. Lee's Army of Northern Virginia to withdraw from Richmond and finally surrender on at Appomattox Courthouse on April 9,1865. In 1866, Congress awarded Grant his fourth star, making him the first full General of the Armies in American History. After serving two terms in the White House, Grant entered business on Wall Street in New York City. He died of throat cancer on July 23,1885 at Mt. McGregor in upstate New York. He was laid to rest in New York City on August 8th with 60,000 marchers in his funeral procession and a million spectators. Local newspaper accounts characterized the monument as "massive and reflective of the stoic strength Grant exhibited during the greatest crisis in our nation's history". The tomb is located at Riverside Drive and West 122nd Street. For additional concert information contact the Superintendent, General Grant National Memorial at -666-1640. Abundant food and dining facilities are available throughout the immediate neighborhood. Want to see our Fall 1999 Newsletter?